Podiatrists are playing an important role in one of the most prominent challenges faced in Europe today; The refugee crisis. This is personified by refugee camps in Mediterranean countries such as Greece and Turkey and has made many headlines. ‘The Jungle’ at Calais, France received significant coverage during 2016 but the headlines don’t necessarily reflect the challenges faced by the individuals populate the camps. Much of the population of these camps have walked thousands of miles as they seek refuge from wars that are affecting many countries in the middle east and north Africa. 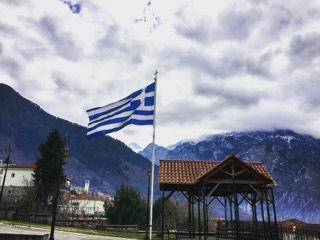 During the annual SCP Conference in Glasgow, last November, Firefly was approached by MSK podiatrist, Jack Loveday seeking contributions to bolster The Foot Project’s scheduled trip to migrant camps in Greece. 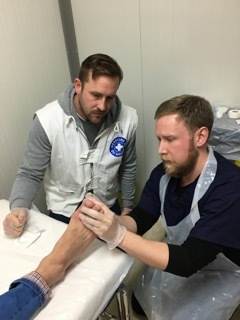 Jack has been involved with The Foot Project since 2016, where he had been part of a team of healthcare professionals who visited the Calais migrant camp of some 10,000 people in northern France. When Jack called to the Firefly stand at the conference he was seeking to acquire podiatry supplies for an upcoming trip to refugee camps in northern Greece, due to take place in December 2016. Firefly donated a consignment of over the counter orthotic devices to the project, made up of our Dragon fly, Super fly and Butter fly OTCs. Six podiatrists set off for northern Greece to join two teams of doctors, nurses, midwives and interpreters from Medecine du Monde. The team spent five days in clinics at the camps, where they treated 83 refugee patients. Interestingly, there was an obvious contrast in the demographics of the patients the project team had treated between the Calais camp in France and the camps in Greece. In Calais, the team’s caseload was largely adult males, in Greece however, women made up 51% of the patients seen. The Foot Project team produced an excellent audit on their return from Greece. The document can be downloaded from this page. You can keep up to date on future Foot Project initiatives by following their facebook page. Firefly looks forward to helping the Foot Project to continue their excellent work in bringing the skills of podiatrists to those who can benefit most.